Every year, when the season changes, so do the colours on my nails. From reds to pinks to monochromatic colours, there is always a colour for the different season! Of course, I wear other nail colours interchangably during each seasons, but there are some specific colours which I prefer to wear over others during the winter. It’s funny because I know pastel/light colours are perfect for the summer but I just adore them for the winter. White Winter Wonderland nail colour, anyone?! Doesn’t pastel just suit winter so much?! White nails paired with a cosy black turtle neck, ahh I’m sold! 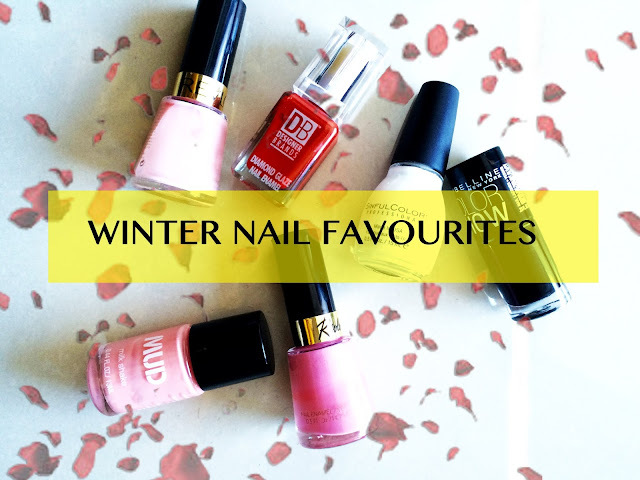 So here are some of my favourite nail polish colours I’ve been wearing and loving this winter! 1. MUD – MILKSHAKE : A gorgeous salmony pink nail polish. It’s shimmery and applies super smooth onto nails! 2. MAYBELLINE COLOUR SHOW – ONYX RUSH : Ahh black… Classic winter nail polish colour! The colour has a slight shimmer in the sun and applies very smooth with two coats covering the whole nails! 3. REVLON – PINK CHIFFON : I love love this colour. The texture takes a little getting used to because it has a gel like consistency (but it’s not quite gel) and requires about 3 or more coats for the colour to show. But after that, the colour is just fab! 4. 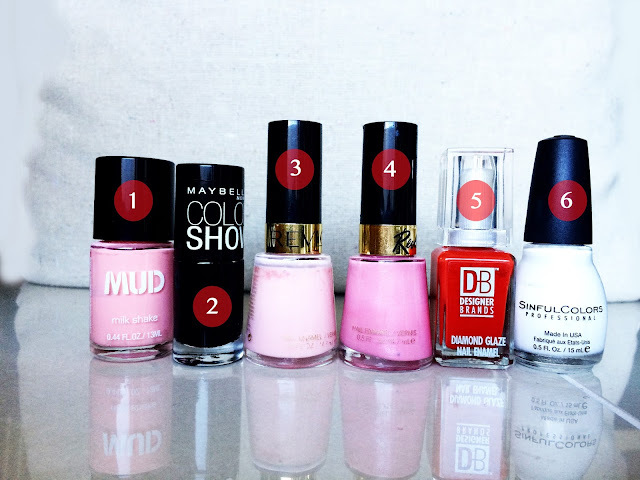 REVLON : A beautiful in between pink colour – it’s not hot pink but also not baby pink. AND it has shimmer – woooo my fave. It’s just a really gorgeous pink! 5. DB DESIGNER BRANDS : RED. The perfect winter nail colour. Need I say more? hehe. The colour for this one is so rich and bright. **Nail polish packaging has changed since I’ve bought mine! 6. SINFUL COLORS – SNOW ME WHITE: Classic white. Winter wonderland colour? This has literally been on my nails for majority of this winter. Especially on a darker/tanned skin, the colour just pops and makes it much more vibrant and beautiful. Next Post Fitness apps you NEED to try ASAP!